A few days ago, our cat, being… well… a cat, was out on the back porch toying with a newly-out-of-the-nest baby Blue Jay. 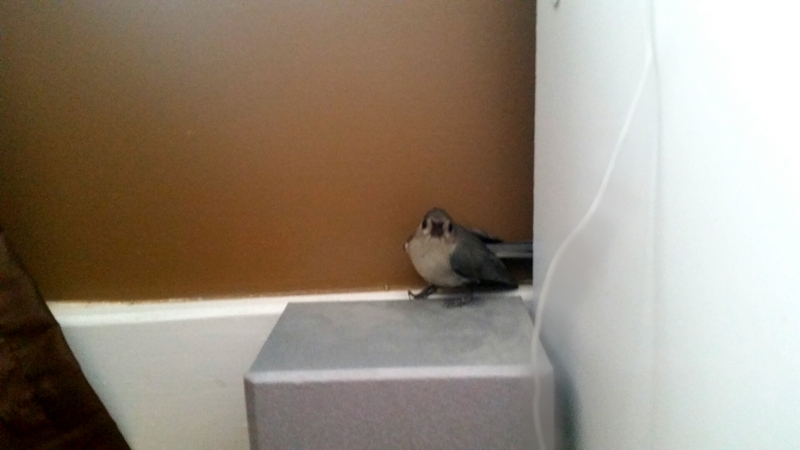 I opened the back door to distract the cat or step in if necessary, but to the cat’s surprise, the dog’s surprise, and especially my surprise, the baby bird flew into the house. Into danger, instead of away from it. In its very understandable panic, its instinct was to just fly – anywhere – to escape imminent danger. Really, aren’t we all that way sometimes? Of course, the cat sped into the house, making a guttural, predatory kind of “meow” specific to a hunt. Her tail twitched, her haunches primed for pouncing onto the bird any time it was near to her. The dog, excited to no end to have something more amusing than afternoon naps, ran around, whining and barking simultaneously. I didn’t even know that was possible. I flung open every single door so we could chase it out. (Actually, I was the only one that wanted it out; the animals wanted it to stay in so they could kill it.) 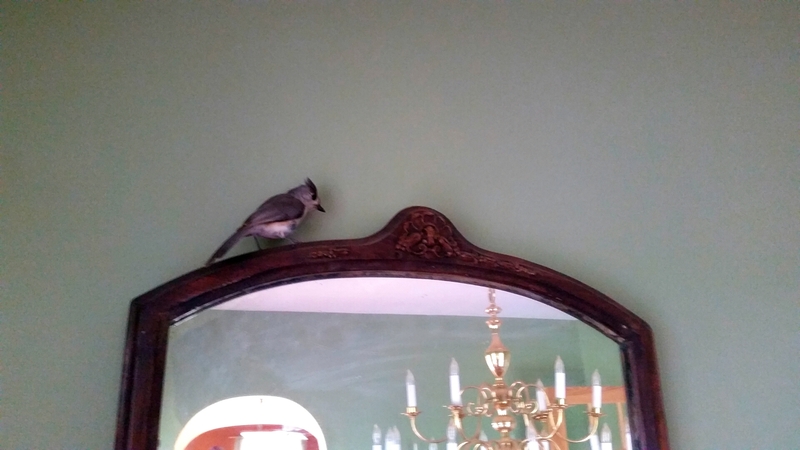 In the meantime, baby Blue Jay ricocheted from room to room, flying ungracefully toward and into windows in an effort to escape. It landed on windowsills, on sofas, on mirrors, on lamps, just about anything it could so it could rest. It was obvious it didn’t have its flying black belt just yet – the exhaustion it must have been feeling trying to stay aloft and out of harm’s way was apparent. It began to realize that flying to some of the higher spots in the house would keep it from those things that wanted to eat it for lunch. 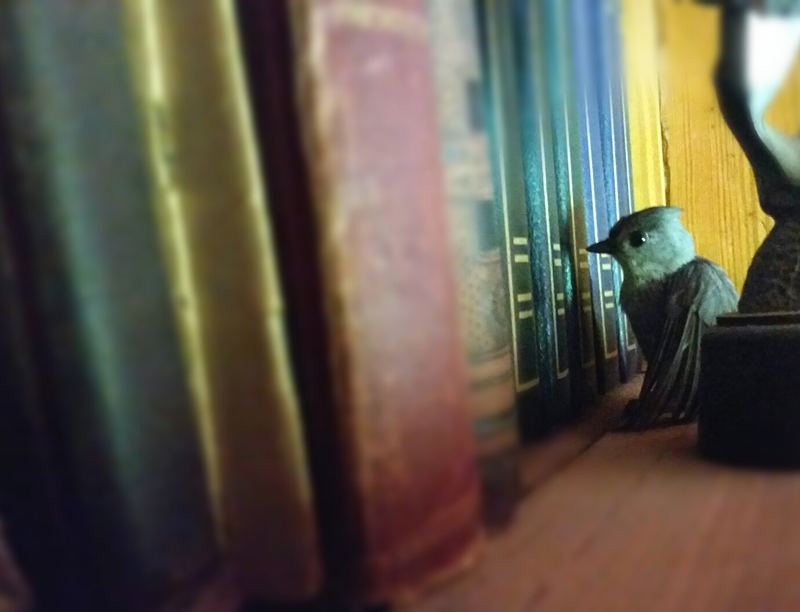 So it started aiming for curtain rods, the dining room chandelier, and perhaps being a very studious and literary bird, tried to hide on the bookshelves in the living room. Because our ceilings are 10 feet tall, Baby Jay decided that the higher he was in the room, the safer he was from the predatory animals stalking him. I”m pretty sure he believed I was one of those animals. I ran to the garage to get a ladder, and moved it 20+ times as he flew from one high place to another in an effort to escape my hand gently closing around his tiny body. Such a sweet little thing, I was able to get inches from him again and again. At one point, I even put my finger up to his feet and like a more domesticated bird, stepped onto it before he flew off. Why was he fighting me? Didn’t he know I was just trying to help? I only had his best interest at heart. Honest. And then it hit me: sometimes I’m that baby bird. On occasion, my instinct is to run toward something – anything – that feels safer than where I am. In my limited understanding, I mistakenly think that I know the best course of action for my life, which, usually, paradoxically, is the “safe,” expected, certain thing. No stepping out in faith for me in these instances…. When the Hand That Holds All Things in its palm reaches out to bring me to safety, my reaction is often to flee from it, much like Baby Jay. At that moment, I can’t comprehend that Someone Else knows what’s best for me even more than I do. I’m reminded of the description of Aslan in The Chronicles of Narnia by C.S. Lewis – he’s not a tame lion. Meaning, he’s unpredictable. Not knowing what Aslan is capable of, or will do, makes following him seem like the scarier choice instead of the wiser, safer one. Jesus is like that too. At one point, Baby Blue Jay flew to the top of the frame of the front door, and since we have double doors, I thought all that needed to be done would be to “push” him downward so he could fly outside. From my perch on the ladder, I tried to move him toward the open door just beyond his sight. 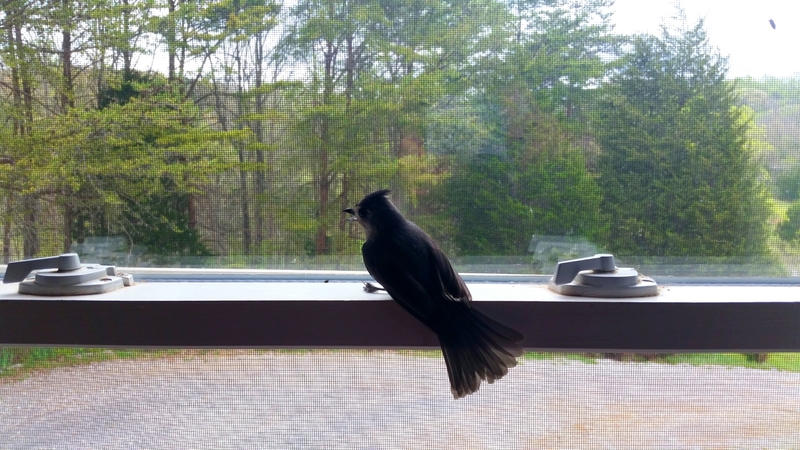 With several windows and doors open downstairs, he flew… you guessed it – upstairs. With freedom and safety mere inches away, Baby Jay chose fear once again. He chose a labyrinth of obstacles instead of open air. He chose the unknown instead of the known. After what seemed like an eternity, he found a haven in my daughter’s room. (So many places to hide!) What I found interesting was that over and over he allowed me to get insanely close to him. Look at the pictures – these were taken with my phone and time didn’t allow me to use the zoom on it. (Yeah, I wanted pictures.) I got close. VERY close. And yet every time I tried to pick him up and let him out the nearest window, he frantically fluttered his wings and fought me with every ounce of his being. Isn’t it often that way with us and God? We face some kind of trouble in our life that – almost instantly – we feel fear and instinctively choose to fight the safety of God’s protection, wisdom and knowledge. If he had only surrendered – just for a second or two – I could have carried him safely back to his habitat. Similarly, if we would just yield to His will – His omniscient, infinite, overarching plan for our lives – we too, would find freedom. calm, and a harbor from the storms facing us. Did Baby Jay ever escape? At some point, he was simply overwhelmed. By fear, by fatigue, all of it. Inches away from escape, he finally allowed me to “scoop” him toward an open window where he flew to the refuge of a tall oak tree just beyond. When you know God, it’s easy to see the assurance of His hand in everything. 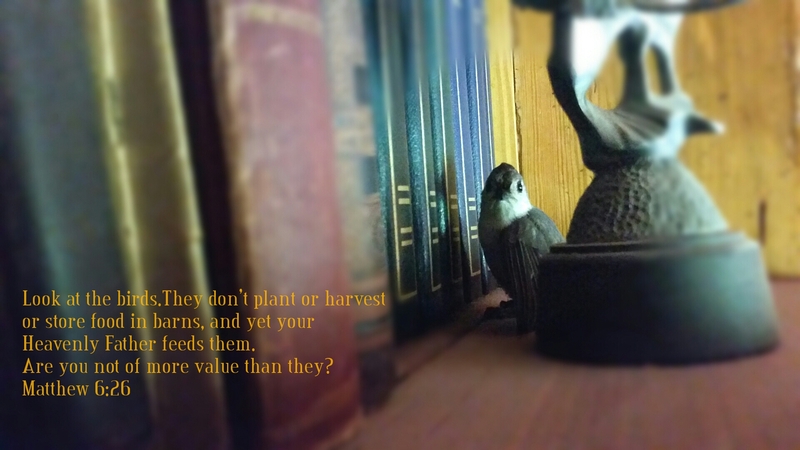 Even when a baby Blue Jay can’t.